You'll be £14.99 closer to your next £10.00 credit when you purchase Images of the Past: The British Seaside. What's this? Drawing on the archives of Mary Evans Picture Library, ‘Images of the Past – The British Seaside’ is a nostalgic promenade through the history of Britain’s seaside resorts from their early genesis as health destinations to their glorious, mid-20th century heyday, subsequent decline and recent regeneration. British coastal resorts developed during a period of vast expansion and social change. Within a century, the bathing phenomenon changed from a cautiously modest immersion in the sea to a pastime that prompted the building of vast art deco temples dedicated to the cult of swimming. Once quiet fishing villages mushroomed into bustling seafronts with every conceivable amusement and facility to entice visitors and secure their loyalty for future visits. Where transport to the coast may have once been via coach and horses or boat, soon thousands of working class day-trippers flooded seaside towns, arriving by the rail network that had so quickly transformed the British landscape. This fascinating book follows these shifts and changes from bathing machines to Butlins holiday camps, told through a compelling mix of photographs, cartoons, illustrations and ephemera with many images previously unpublished. Covering every aspect of the seaside experience whether swimming and sunbathing or sand castles and slot machines ‘The British Seaside’ reveals the seaside’s traditions, rich heritage and unique character in all its sandy, sunny, fun-packed glory. A splendid collection of nostalgic images dating back more than a century. ★★★★★ I loved this book a lot: there are candid photos of undone hair, donkeys with names on their harness, damp handkerchiefs as sun hats, athletic attempts, much playing in the sand, dance halls, and amusement parks alongside promotional postcards. Amusement parks, dance halls, athletic attempts. It had been a little jarring to see a sepia or full-color photograph/postcard amid all the calming black & white prints, but it was easy to see that people chose to bask in chalets, tents, bungalows, wicker settees, hotels, caravan, or just pulled up the back of their car next to the seashore. This is an absolutely magnificent stroll down memory lane, packed with brilliant photographs of how the British people discovered and relished their holidays and trips to the seaside around Britain. There must be hundreds of thousands of such photographs in archives, in people's collections - I hope Pen and Sword can find more to publish in subsequent volumes! Truly breathtaking and hugely enjoyable. I’ve been carrying the book with me and pestering everybody I’ve met, showing them some of my favourite pictures. I even talked about it on the radio programme I host (I know, I know, pictures on the radio…) at Penistone FM. Who would I recommend it to? Everybody! For some, it will bring memories, either of things they’ve experienced, or of things they’ve been told, and will help them tell their stories. For others, it will be a compelling slice of social history. If you like the seaside, you must check it out. If you’re interested in social history, you must check it out. If you love pictures and postcards, check it out. If you are intrigued by changes in fashion, transport, entertainment… check it out. If you love donkeys, check it out. Last but not least, if you want me to shut up about it, check it out. “a rollercoaster ride of delights”. Head back to the coasts of your youth, from donkey rides to knickerbocker glories, in this nostalgic treasury by Luci Gosling. If you were a Butlin's babe, and loved catching a train to the coast, you're in for a treat. I love books like this and was really excited to pick this one up and start it. I loved the images, the background history and the captions. I read the book in a few hours but its definatley one that I would treasure and keep. I do love seeing images of the past and this one had some brilliant ones - 5 stars! This delightful book with its images of the seaside will take you into a world of nostalgia, gaudiness and even glamour. There are photographs, posters, cartoons and paintings of every different aspect of the British enjoying coastal resorts in bygone days, such as the transport, the entertainment and the fashions, as well as the cliched scenes of happy families and children building sandcastles. Some of the pictures are amusing, such as the ladies wearing string vests on their heads, the men in suits on hot summer days and the lady in beach pyjamas which look home-made. The writing is interesting and easy-to-read and the captions are extremely detailed. This fascinating slice of British social history is a celebration and also a lament for the golden days of the British seaside resort. Covering a period from early Victorian times to the 1970's it charts its rise and rapid decline. The book draws on the archives of the Mary Evans Picture Library and the images of old photographs and picture postcards are an excellent corollary to the informative text. I absolutely loved this book! 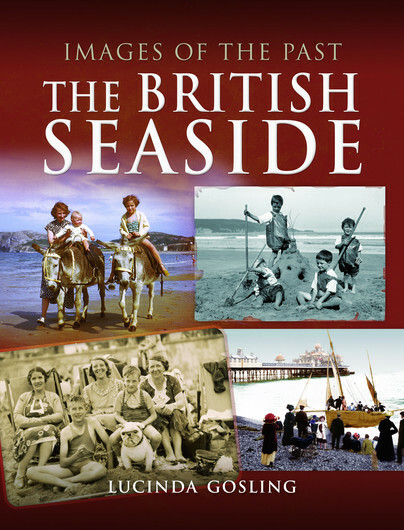 In fact as I reviewed it digitally I can add that in this instance the e-book does no justice to the superb collection of photos and picture images that the author Lucinda Gosling has brought together to illustrate this relevant social history of the British seaside. I am immediately going to buy the hardback version of this and possibly - as I now live in landlocked Nottingham- have a day trip to Skegness. 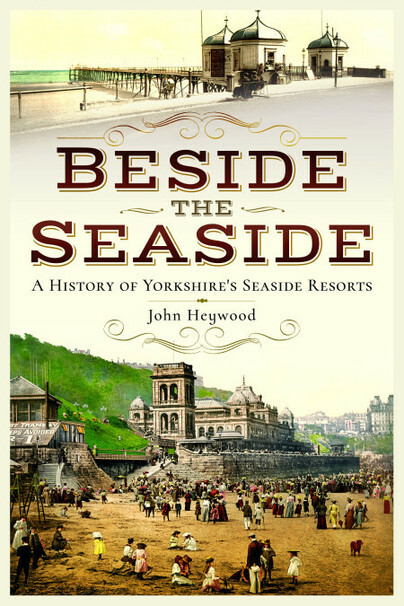 Do read this book, then armed with bucket and spade go forth and rediscover our seaside. I loved this book, looking back over the years at how people have changed and how happy they were, and how fashion is so different. I love postcards, a very good book. A must read if you love postcards. I have always enjoyed trips to the seaside, and so was interested to read this book with its historic photographs of the British Seaside. This book is divided into sections, with topics ranging from 'The Beach' to 'Travel and Accommodation'. Each section has a short introduction, followed by many photographs relating to that topic. I enjoyed both the photographs, and the short comments under each of them. My favourite section was that entitled 'Entertainment'. The book was an interesting look at this aspect of British life. A nostalgic look at the British seaside featuring a host of photographs from a bygone age. Well worth reading and viewing. This is a fantastic book. I just knew by the title that I would love looking at the pictures in this book. I love old pictures, especially of the seaside and of places that I know and have been to. This book was full to the brim with varying pictures of seaside towns and places. The pictures are obviously, as the title states, images from the past and they range between early 1900’s to 1970’s. Some of them are pictures of places, some are pictures of people, but they are all delightful and I’ve sat and pored through them, enjoying looking at every single one of them. There is very little writing in the book, just a short intro for each chapter and a short description for each photo, detailing the place and year if known. Some of the places I know very well and enjoyed looking at them and comparing them to how it looks now, such as Blackpool, Margate, Weston Super Mare, Brighton and Llandudno. The pictures spread out across the country from the East coast such as Filey, Skegness and Scarborough; Kent such as Margate and Ramsgate; South Coast, such as Bognor Regis, Brighton and North West such as Blackpool, Southport and North Wales. I’m so glad I got this book and have really enjoyed looking at a well presented selection of old pictures. My favourite views are from the 1970’s and I myself have collected many seaside postcards from this area - if the author is reading, I’d love to see another book like this but with more recent pictures from the 70’s, 80’s and 90’s to compare how they’ve changed!! Please!! Lucinda Gosling studied history at the University of Liverpool and has worked in the picture library for 23 years, most recently at historical specialist, Mary Evans Picture Library. She is a writer and public speaker, contributing to various publications including History Today, Tatler and Majesty and is author of over ten books on a wide variety of subjects from historic London to Great War knitting.